YAKINDU Traceability is a patent-pending, professional tool that helps you to describe and trace the life of your project requirements. It enables easy and well-arranged traceability management. a formal object in one DOORS module may represent a customer requirement, while a formal object in a different DOORS module may represent a software test case. 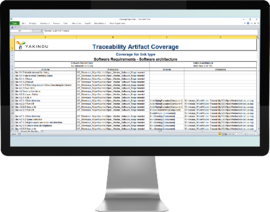 With YAKINDU Traceability’s configurative approach, you can specify which engineering artifacts exist, where they reside and how they should be recognized. 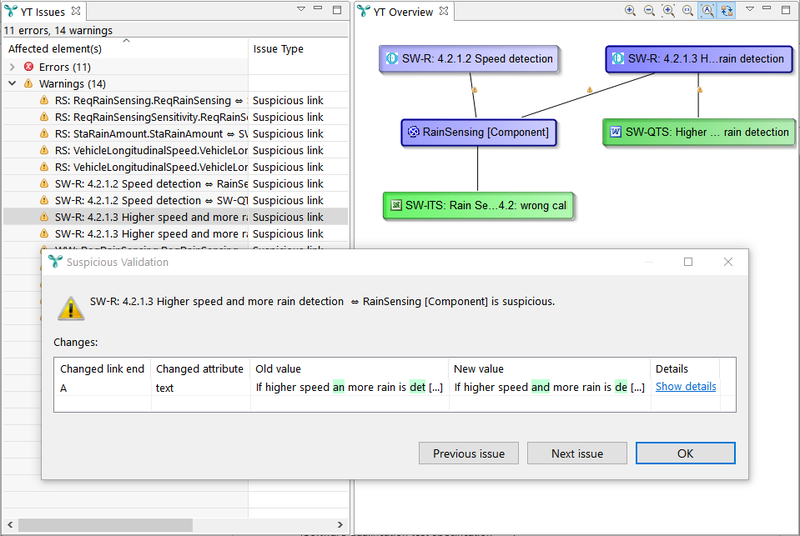 Furthermore, you can configure whether traceability links should be derived from existing relations or matching attributes of your engineering artifacts and/or if such links should be maintained manually by an engineer. 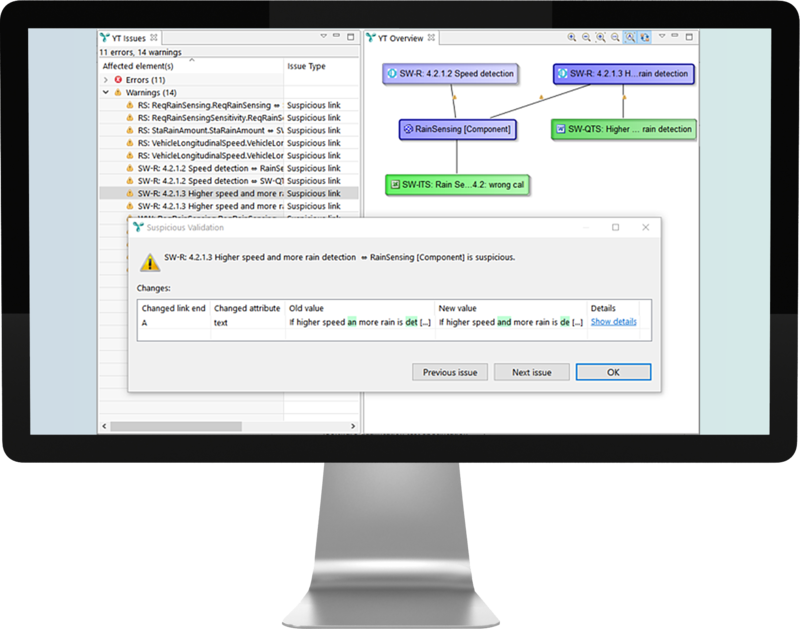 You decide whether to link your tools in a specific context and/or to which extend you want to comply to process standards such as ISO26262, Automotive Spice, DOA178, EN 50128, etc. YAKINDU Traceability really interacts with your tools. 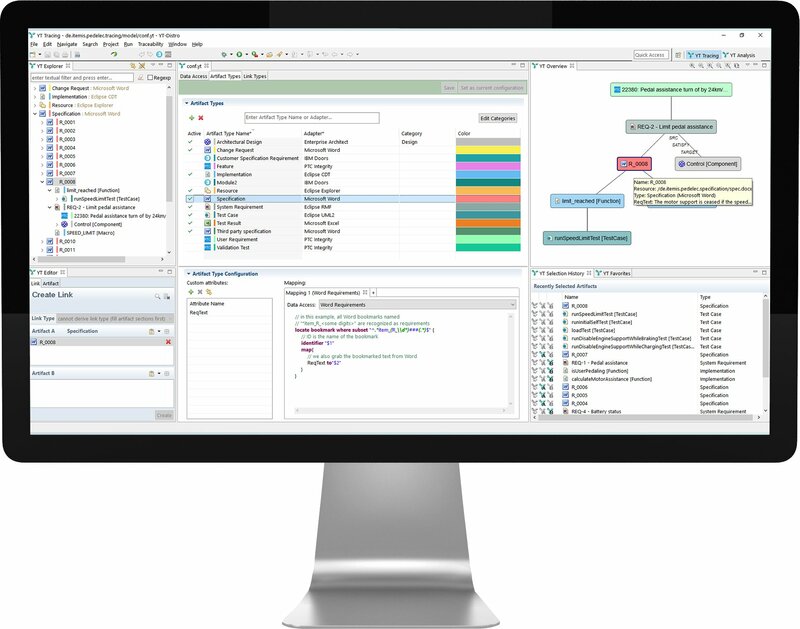 You can navigate between interrelated artifacts or analyze their dependencies with a simple mouse-click. Selections are propagated from engineering tools to YAKINDU Traceability and vice versa. As one of our customer explained to us: “This is real traceability”. The context sensitive user interface prohibits – of course – the creation of traces violating the trace configuration. Several validations may reveal inconsistencies such as links to artifacts which have been deleted, duplication of trace links or changed “suspicious” artifacts. Better than that, YAKINDU Traceability does not only reveal inconsistencies, it also provides wizards which make your data consistent again. 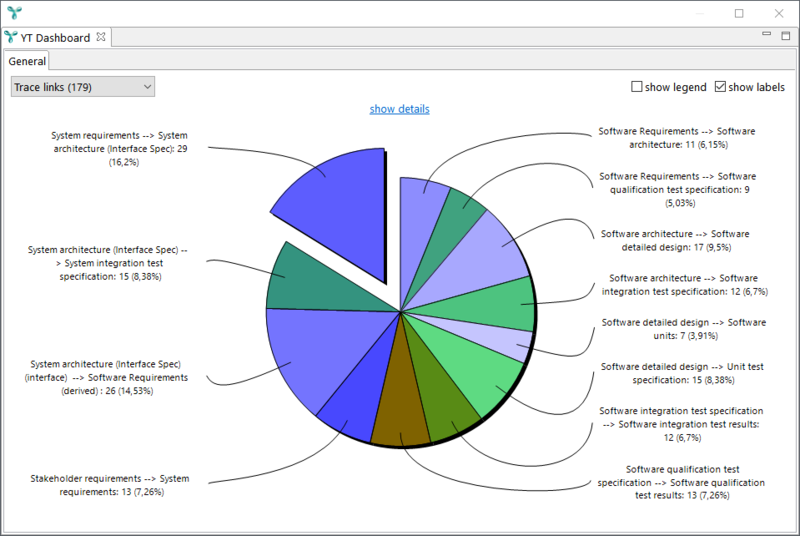 The dashboard provides nice charts visualizing the results of predefined queries. 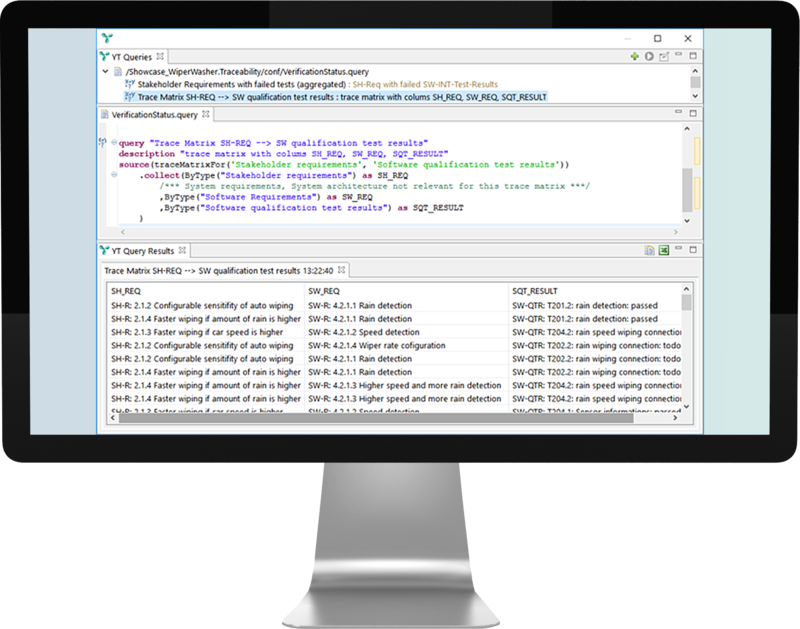 You can create custom ad-hoc queries with the YAKINDU query language. This language is optimized for fast and easy traceability analysis. 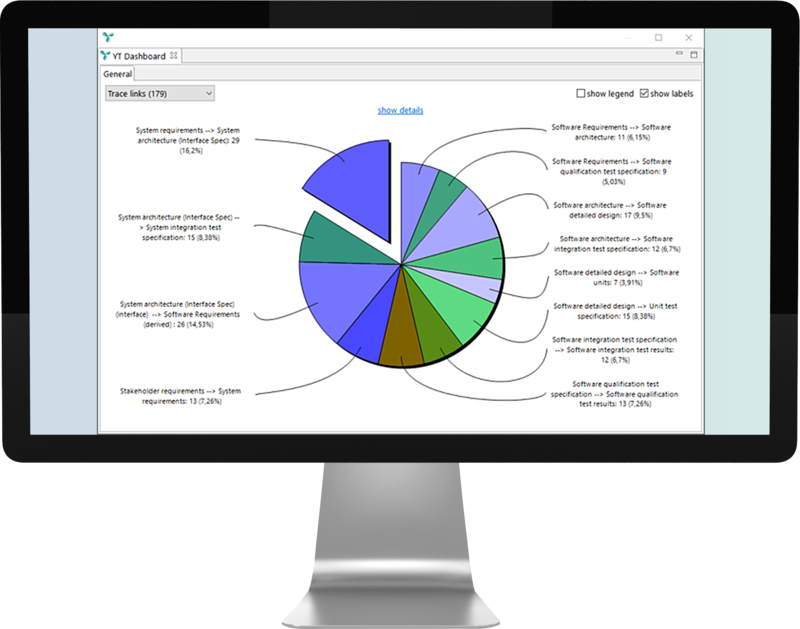 YAKINDU Traceability includes a Reporting Engine that renders your results ready for presentation in PDF, Excel, Html or Word. You may want to export the traceability data into a relational database. YAKINDU Traceability even provides means to map these data into a pre-existing database scheme and thus is able to populate a custom database.